An ice-age fossil found recently in San Diego's North County was revealed Monday at the San Diego Natural History Museum. A complete skull of a Bison latifron was found at a highway construction site on State Route 76 East Project near Pala Mesa. 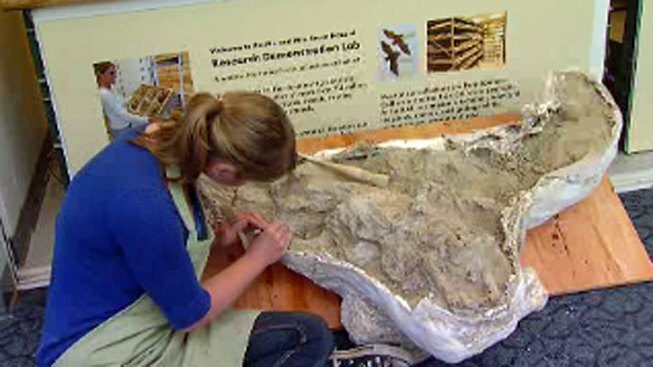 Museum experts say it’s the first-ever fossilized bison found in Southern California. The bison is estimated to be roughly 100,000 to 200,000 years old. The animal was an evolutionary cousin of the living plains bison standing 8-feet at the shoulders compared to the modern bison that may be 5 to 6-feet tall. The fossil was really well preserved with both horn cores Demere said. "We’ve know that Bison latifrons lived in the Southern California region but we’ve never been able to look at the skeleton as complete as this one is," he said. In February 2009, construction crews in downtown’s East Village stumbled upon the tusk and skull of a mammoth believed to be 500,000 years old. Those fossils were discovered at 11th and Island Avenues, at the construction site for the Thomas Jefferson School of Law. Days later, that same construction site gave up another prehistoric find when excavators discovered the skeleton of a whale beneath the mammoth fossils.